How do you eat well in Portugal? Go where the locals go. There's a place called the 'Boca do Inferno' – the Mouth of Hell - just west of Cascais on the Portuguese coast and, if Giles Coren is to be believed, you might as well go and jump into it now if you haven't had the foresight to book a self-catering holiday because hell is what your mouth will feel like after a Portuguese restaurant meal. I'm not convinced, though. Take a look at a typical meal and you decide. It doesn't look so bad, does it? To find out more about what to eat and where to eat it, click here. While I don't think Portugal boasts one of the great cuisines of the world, and I certainly think there are some noticeable shortcomings, I do think you can eat well if you are careful. If you have read Giles Coren's excoriating review of a new Portuguese restaurant in London, well larded with memories of miserable meals in the Algarve, you will realise that he paid around £40 for his meal, which is a lot if he didn't like it, while his memories of eating out in Portugal were in the Algarve, which isn't really Portugal: it's BritaincumGermany with hot weather. 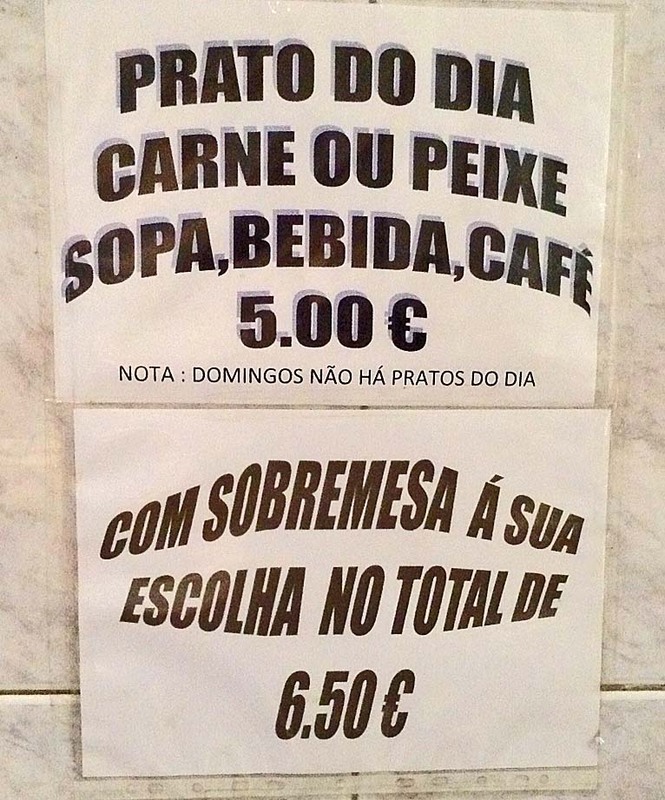 When you eat out in Portugal, the thing you need to remember is that, by and large, the cheaper the places you eat in the better the food tends to be. The average Portuguese working family has not got much spare cash and wouldn't tolerate bad food so find out where they eat. Typically they will choose a simple, unpretentious restaurant, which almost certainly will serve simple unpretentious food. Food just like the meal of pork escalope and chips with a crisp fresh salad in the picture above, which we ate in the Caravela do Ribeiro restaurant in Oporto. You can see it in the pictures below. Remember that I said Coren's meal cost £40, somewhere in the region of €55 at the present rate of exchange. Have a guess what this meal cost as I take you through it. The price is at the end. So you've seen the main course. Now for the starter. We began with the ubiquitous vegetable soup. One of my criticisms of Portuguese meals is that vegetables seem only to come in a potato based soup. This is not to say I dislike the soup. I don't. The Portuguese are in fact masters – or more probably mistresses – of delicious vegetable soup. However, you can get bored with it and I sometimes long for a good tomato and roasted red pepper or a mushroom soup. Anyway, as I said, vegetables don't accompany main courses. Meat and two veg = meat potatoes and rice in Portugal. Nevertheless, a main dish is usually supported by a really crisp salad and I promise you that lettuce from a British supermarket isn't a patch on a fresh Portuguese lettuce and as for the taste of the plumpest of tomatoes and mildest of onions drenched in olive oil and seasoned with salt.... Well words fail me they are so good. You may have spotted the drink we chose to have in the first picture. It could have been beer or wine but we chose freshly squeezed orange juice – absolutely scrumptious! We could have stopped after two courses but were tempted by a 'pudim caseiro'. Quite often you will be offered a menu with commercially made desserts. Avoid these like the plague. I find they always disappoint but a dessert made in house, "caseiro" is likely to please. 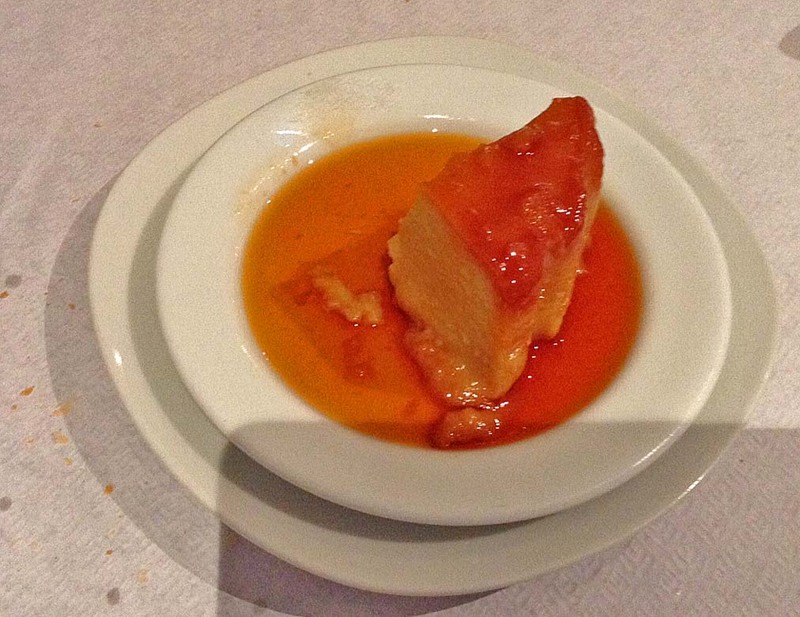 We usually go for 'pudim flan' – crème caramel to you and me – or 'leite creme' which we know as crème brulée. So this was really quite a substantial meal of soup, bread roll, fresh orange juice, pork escalope with chips and fresh lemon to squeeze over it (we rejected the rice as unnecessary, by the way) salad and crème caramel, followed by a small black coffee. We could have had a fish alternative to the pork had we so chosen. We could have dined on something similar on the water front, which we have often done for the atmosphere, the view of the Eiffel Bridge and a pleasant stroll by the river as a digestif afterwards but it would have cost a lot more and been no better, possibly not even as good. So how much did this cost? How's your Portuguese? Have a look. Yes that's right! 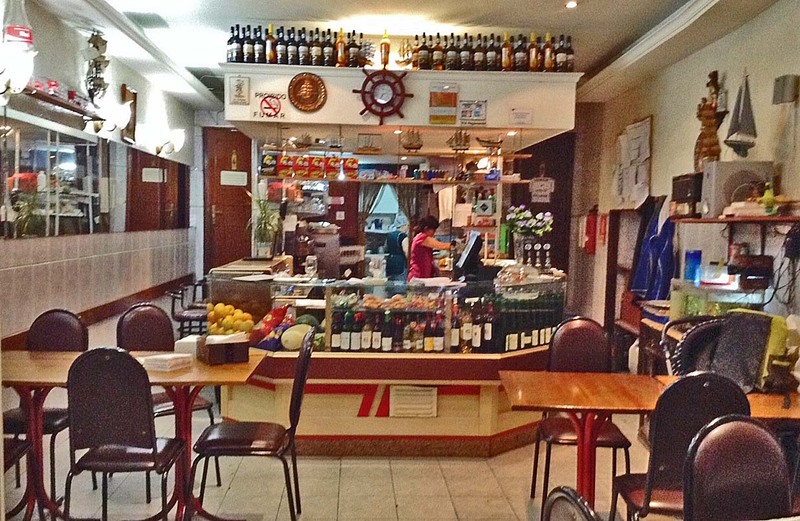 Dish of the day – meat or fish - soup, drink and coffee would have been €5. We chose to have the "dessert of your choice" and paid €6.50 or around £4.60. Come on Giles Coren, admit it. You just don't know where and what to eat in Portugal! I wanted to comment what you said about Portuguese soups. If you go to normal cafés and restaurants, specially in the cities, you will almost always find potato-based soups in the daily menu because that is a kind of soup that most people will like. However, that does not mean we only have potato-based soups. If you go to more tradicional restaurants, specially the ones that are for the local population and not for the tourists, you will discover a few different soups that have very different tastes. Some you can find all over the country, just like "sopa da pedra" (literally "stone soup", made with different meats), "misturadas" (soup with cabbage and beans), "canja de galinha" (chicken soup), "sopa de grão e espinafres" (soup of chickpeas and spinaches) or "caldo verde" (soup with cabbage and chorizo). Other soups are more regional and, therefore, you will probably need to travel to taste them traditionally-made, like "gaspacho" (it's a cold tomato-based soup that you can find in Alentejo and in Algarve), "sopa de castanhas" (soup made with chestnuts and chorizo that you can find in the north of Portugal), "açorda" (it's a bread-based soup that can have very different other ingredients, depending on the region that you are eating, since fish, vegetables, egg, etc, etc). Of course some of those soups also include potatos as an ingredient, but the taste is always of some other main ingredient(s). Please give it a go to some of those soups and give me some feedback of what you thought about them. P.S. Just be careful where you try those soups because most of the times their taste differs a lot from place to place. Yes I do know some of these soups but, in my experience they are rarely offered in restaurants, with the possible exception of caldo verde. Often you may find a soup called 'sopa de feijao' for example but it is really only sopa de legumes with more beans in it. Chestnut soup is certainly offered in Marvao but it seems to me that it is only during the chestnut festival of the Serra de Sao Mamede. I don't know if you saw Giles Coren's terrible review of Portuguese food in the Times. What I really wanted to do was to say that I thought it dreadfully unfair; to point out that simple, everyday Portuguese food is not only excellent but very reasonably priced too though the menu is often limited. I wasn't even criticising the fact that the menu is limited because, as I said, we tend to eat in small, local restaurants where you can meet friendly waiters and talk to other diners. I prefer that to posh restaurants where you have to be more circumspect. For me, eating out is about much more than the menu; it's about the atmosphere, about making friends and sharing experiences. I was, incidentally. delighted to see that a review in the Sunday Times, written by A A Gill, who can be rather unpleasant in his views, was actually extremely positive and complimentary about the new Portuguese restaurant in London. I think really that you and I are on the same side. 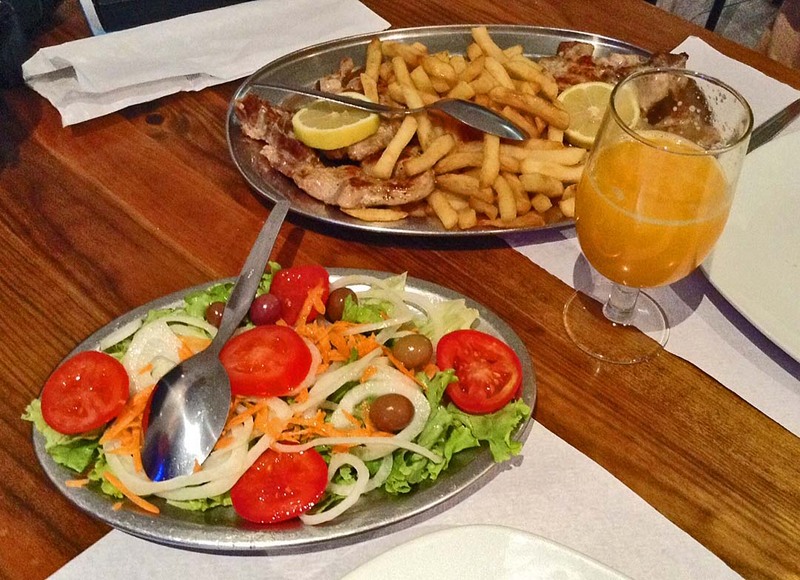 We want to say that if you choose your venue well, Portuguese food can be wonderful. Obrigada pela recomendacao. Faz muito tempo que nao visitamos o Algarve mas a proxima vez vamos com certeza almocar ou jantar em Olhao. Por aqui dizem que o melhor peixe encontra-se em Matosinhos, uma vila mais perta de aqui. Se o Pedro por acaso passe pelo norte talvez possa almocar ali. why am i not surprised? What else to expect from someone brought up on England's most sophisticated dish: fish and chips (a Portuguese invention)? Perhaps he had one glass too many of England's national dish: cheap wine. Even nandos is better than anything that England has to offer. To those 'food experts' who are as clueless about Portuguese food as mr Giles Coren, here are some suggestions: cataplana de marisco, carne de porco à alentejana, feijoada à portuguesa, leitão à bairrada, arroz de marisco, bacalhau à gomes sá, bacalhau com natas, caldeirada de peixe, espetadas, trinchado, frango no churrasco, bife à portuguesa, chanfana de cabrito, camarão à piri-piri, coelho à caçador, lulas recheadas, salada de polvo and too many other things to mention. Bom proveito. You make my mouth water. Leitao - now there is a dish for the Gods!